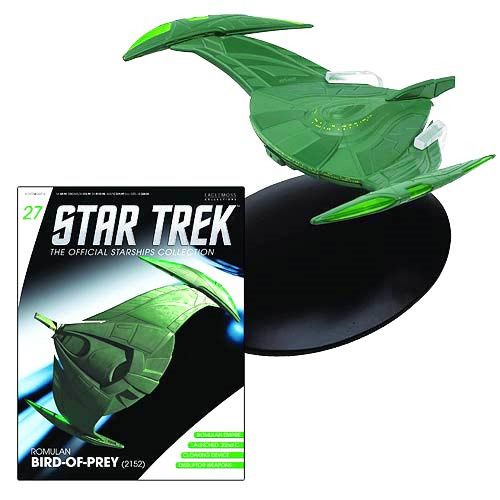 The Romulan Bird of Prey Vehicle #28 in the Star Trek Starships Romulan Bird of Prey Vehicle with Magazine has been painstakingly recreated in die-cast and high-quality plastic materials, and hand painted with an incredible level of detail. It measures approximately 5-inches long x 3 1/2-inches wide x 2-inches tall and comes with a collector magazine! Ages 14 and up. This incredible collection of Star Trek vehicles includes all the most significant ships from the five Star Trek television series. It features a full range of Federation and alien vessels, including seven incarnations of the Enterprise, all the major Klingon vessels (including the Bird-of-Prey), Dominion, Borg, and Romulan ships!